To unrig the economy and our democracy, America needs strong unions. 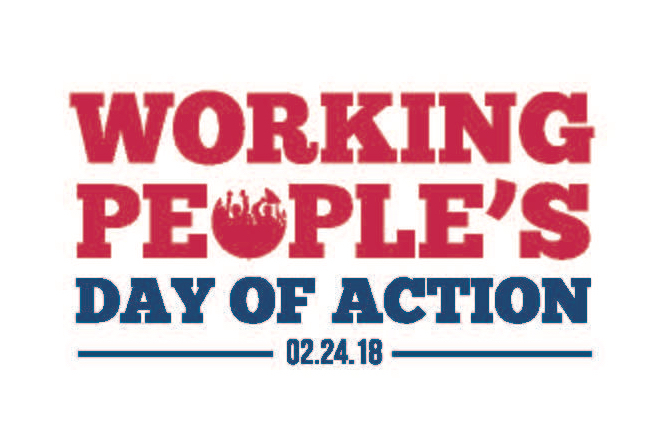 What is the Working People’s Day of Action? In 1968, Dr. Martin Luther King, Jr. gave his life in Memphis, Tennessee, to help African- American sanitation workers come together to win freedom and dignity on the job. Today, a handful of corrupt special interests, backed by the Trump administration, want the Supreme Court to turn back the clock and keep rigging the system against working people when the court takes up a case called Janus v. AFSCME. If the Supreme Court sides with the corporate interests, those who work in the public service — such as nurses, teachers and firefighters — would be denied the freedom to have strong unions that make our communities safe, healthy and strong. And it could cut off a path to the middle class for millions of Americans, especially minorities and communities of color. The Working People’s Day of Action is about thousands of people nationwide demanding an end to the rigged system and those who seek to divide and silence us. We will stand shoulder to shoulder uniting for freedom — for men and women, for immigrants and native-born Americans, for people of every race, religion and sexual orientation. What is the Day of Action’s connection with Dr. Martin Luther King, Jr.? Today, a number of greedy billionaires, corporate lobbyists and their political allies want the Supreme Court to roll back our rights and freedoms. On February 24, we will demand an end to the rigged system and defend the freedoms for which Dr. King fought and died. Where will the Day of Action take place? Thousands of people will gather in cities across the country, including Los Angeles, San Diego, Memphis, New York City, St. Paul, Philadelphia, Columbus, Miami, Detroit, Chicago and Washington, DC. Janus v. AFSCME is about taking away the freedom of working people to join together in strong unions to improve our lives, support our families, and contribute to our democracy and communities. Real freedom is about more than making a living; it’s also about having time to take a loved one to the doctor, attend a parent-teacher conference and retire with dignity. The wealthy elites behind this case do not want us to have the same freedoms as they do to negotiate a fair return on our work. The National Right to Work Foundation is backing the case. The group is part of a network of extremists funded by corporate CEOs to use the U.S. legal system to rig the rules against everyday working people. For decades, these wealthy elites have used their massive fortunes to gain outsized political influence, suppressing our voices, limiting our votes, restricting our health care, defunding our communities, and chipping away at the progress unions of working people have achieved for millions of workers and generations of working families. Now they want the highest court in the land to take away our freedom to come together to protect the things our families need, like family-sustaining wages and jobs that make ends meet, retirement security, health benefits, quality public schools and services, and more.